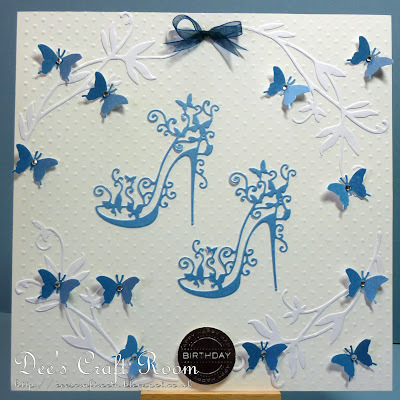 Dee's Craft Room: Killer Stilettos! Hi and a big welcome to anyone visiting my blog for the first time. It is so great to have new visitors, but it is even better when someone chooses to come back again. A new challenge starts at Crafty Boots Challenges today. The theme of this challenge is 'Die Cuts', it was was chosen by the very talented Helen. Your design can be anything you like, as long as it contains at least one die cut. I little while ago I bought several large embossing folders to use with my Grand Calibur. However, I have not really used them that much and this challenge seemed like an opportunity not to be missed, so I got my favourite dotty one out for this card. Having embossed some white card I then got out my dies. These fabulous stiletto sandals are from Tattered Lace and the flourish is from Marianne Design Creatables. As you can see, the sandal straps are made up of tiny butterflies so I added a few more butterflies to the design with the aid of a Martha Stewart punch. I then added a few flat backed gems, a bow and a Craftwork Cards sentiment. The rest of the Crafty Boots Challenges Design Team have been very busy making some inspirational pieces, please pop by and take a look. Lovely card - very sophisticated! Thank you for the welcome back. My blummin' elbow is pretty sore still and it'll be months before I'm anywhere near fixed but it's soooooo much better than when I first broke it! Need to focus on the positives!